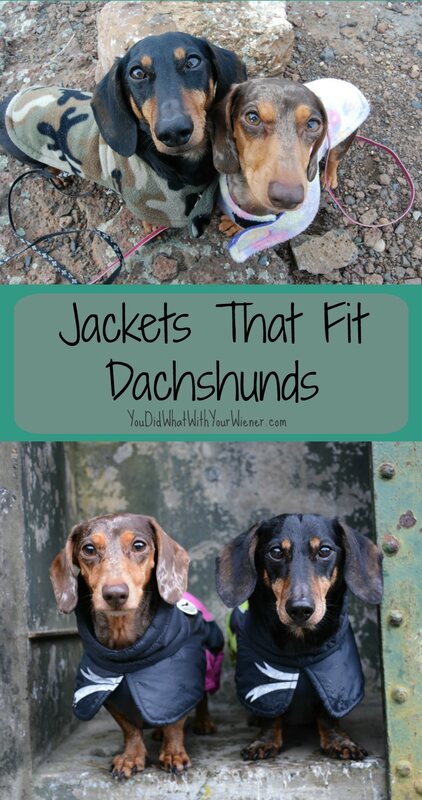 We know all to well how hard it can be to find jackets that fit the Dachshunds long body, deep chest, and accommodates their short legs. 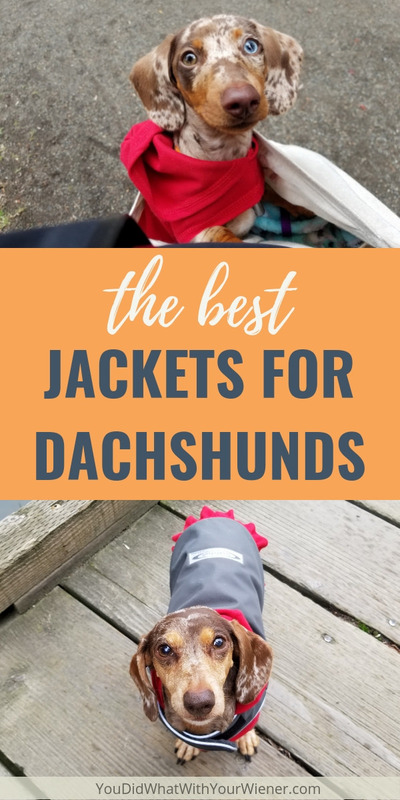 Since fall and winter are approaching, I thought this would be a good time to list the jackets we know, or have heard, are the best for Dachshunds. We’ve tried a lot of Dachshund jackets ourselves. Some I bought myself, some were sent to us to test out, and some belonged to friends. Out of the ones we’ve tried, these are our favorites. Chester and Gretel have short, slick hair so they’re almost always a little cold. Unless it’s in the heat of summer, I put a thin, fleece jacket on them when we go out. 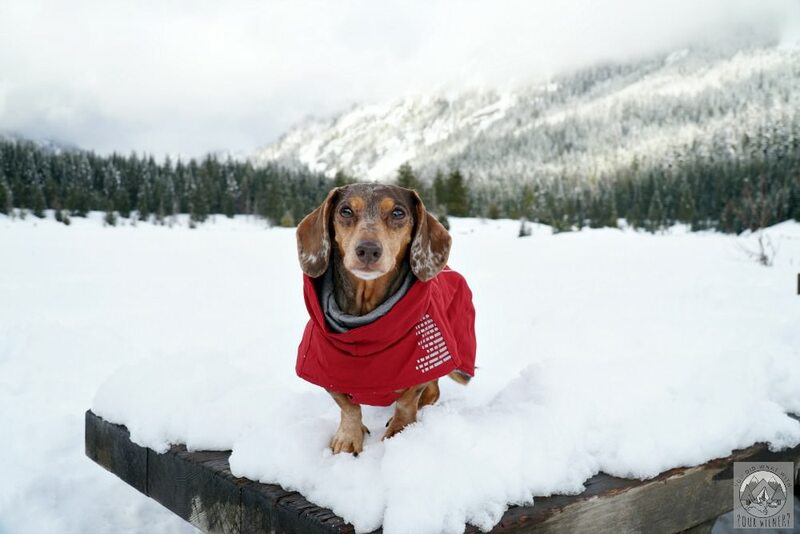 We were recently given the opportunity to try the Fuzzie® Fleece Dog Coat from Teckelklub – a brand that fits Dachshunds well we’ve been familiar with for years – and they are the perfect thickness to help keep a light chill off. Read our review and check out our other pictures of the jacket HERE. The Fuzzie is also a great addition under another jacket to add additional warmth. For example, Teckelklub makes a Winter Trench Jacket that is waterproof with a fleece interior. It’s not always warm enough for the coldest winter temps though. When it’s really cold out, I layer a Fuzzie underneath. 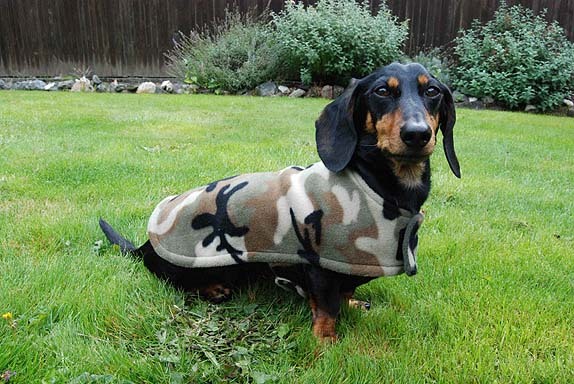 Another dog jacket from Teckelklub I like is the Bunnyhug Fleece Dachshund Jacket (hoodie). It’s a thicker fleece than the Fuzzie above (approximately double the thickness), is 100% windproof and breathable, has a 2” wide 3M™ reflective strip down the back, and has a hood. The fact that it’s windproof makes it a good choice for blustery days. The Fuzzie, Trench, Bunnyhug and Sweet Hoodie are our favorites but Teckelklub also makes a warmer winter coat – The Pinnacle Winter Dog Supercoat™. The coat is designed to keep your dog’s core body warm and dry at all times. It’s made from waterproof, high performance ripstop fabric and is lined with anti-pill, high quality Teckelklub Fuzzie fleece. 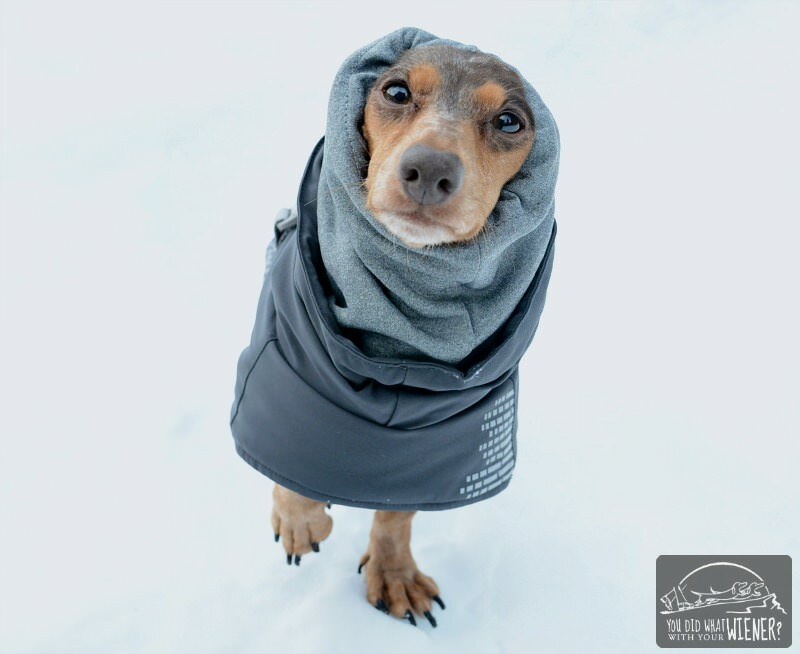 The built-in fleece neck gaiter and chest panel helps to keep little, short dogs extra warm. It helps keep your dog seen in the dark with a reflective harness opening cover and high quality 3M reflective piping around all sides. I like that it has a really big opening around the front legs. Because of this, I don’t see that it would cause chafing when we hike. I’ve been searching for years for good outdoor adventure jackets for Chester and Gretel. 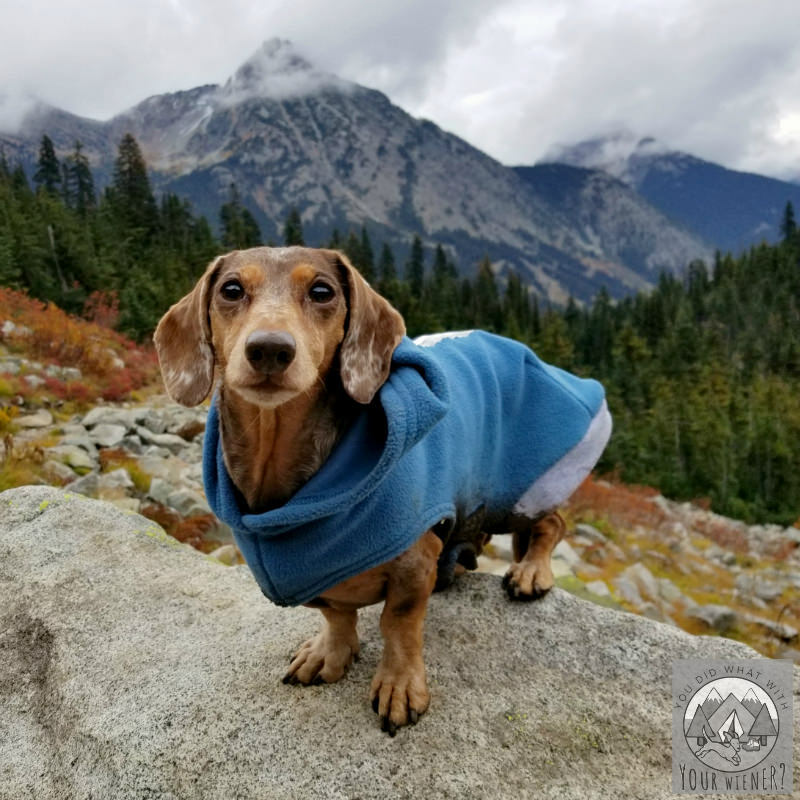 Not only is it hard to find jackets that fit Dachshunds, but it’s near impossible to find jackets for hiking and snowshoeing that meet my high standards (I’m a gear snob so I won’t settle for anything less than human quality for them). I found Hurtta, a brand from Finland (Finland weather is similar to western Washington where we live) a few years ago and absolutely love them. Although their jackets are made for all dogs, the size and dimension of the jackets fit Chester and Gretel well. We loved their jackets so much, they started sending us some of the ones we didn’t already own to test them on Dachshunds. Note: This model is soon to be continued so snap one up while you can. I mainly use the Torrent Raincoat on days that are wet and rainy but only a little cool. The outside fabric is made of a highly water resistant and breathable laminate called Houndtex®. The inside is lined with a thin, fleecy nylon to add a little warmth. Two great things about this jacket is that it has a panel that covers the chest and it drops down to cover their rear legs. It makes a nice warm cocoon around their body without impeding their movement at all. (note: the Torrent coat is being phased out for the new Drizzle Coat but the Torrent is still available on Amazon right now – use the link above to find it). These are the jackets we use in the coldest temperatures. The jackets have a panel that covers the chest. They also the flaps in the front and the back that snap around their haunches to covers their legs and keep them warmer. Basically, this jacket is a wearable, warm cocoon. Thinking of Getting Your Dog a Hurtta Jacket? Check Out Out Easy Sizing Guide HERE. Sometimes the Torrent Rain Coat does not offer enough warmth and sometimes the Extreme Warmer is too much (and we need a little more rain protection with the warmth). The Summit Parka is really warm but more in the middle. It still has a chest panel but not the flaps to cover the legs. Unfortunately, Chester had some trouble with it because his legs are shorter than Gretel’s and he’s between sizes so the one he has is a little large on him. Because it’s big, the chest panel sags a little and his legs get caught. I still love it for Gretel but I’m sticking with the Extreme Warmer with him. These thick, double-fleece jackets have been our go-jackets for years. They’re great for bumming around the city when it’s cold. I know they will fit perfectly because they are custom made according to Chester and Gretel’s measurements. The lady that makes them lives in our home state of Washington and owns 4 Doxies herself so she knows how to fit them well. Chester and Gretel get dirty often so it is great that these jackets can easily thrown in the wash. In fact, they are so affordable (the most expensive one being $25) I bought several of them so there is always one to wear while the others are washing. While these jackets are not waterproof, they are thick enough the water only soaks through in heavier rains. Some jackets we have had our eye on for a while are from Chilly Dogs. They make outdoor jackets for active dogs. Their jackets are not custom made but they specialize in fitting unique body types. They do ask that you include your dog’s measurements so that they can make sure you get the size that will fit your dog best. Their jackets do not allow for harnesses to be worn under the coat. They suggest that you adjust your harness so it can be worn over the coat…which is common practice for us when Chester and Gretel wear jackets with no harness holes. They can be washed in a washing machine. We specifically have our eye on the waterproof Trail Blazer jacket. We have heard raving reviews for jackets from Noodle and Friends. I love that they are stylish and cover the chest area. They make several designs including rain, waterproof and insulated jackets. I haven’t bought one yet though because they are not cheap and the instructions say they should be hand washed. For as often as we have to wash ours, that is not practical. Some of their jackets have a hole for your harness D ring and some jackets have a D ring attached to the back to attach a leash. Did I mention they were stylish? The Classic Trench and the Donegal Plaid Dachshund Coat just might be awesome enough to compel me to get one anyway. 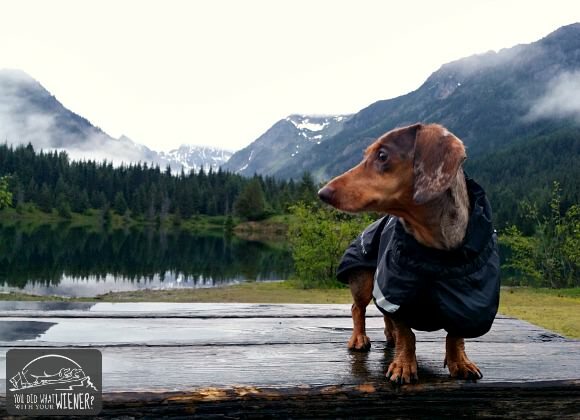 Our friend Ammo the Dachshund likes his jacket from Voyagers K9. 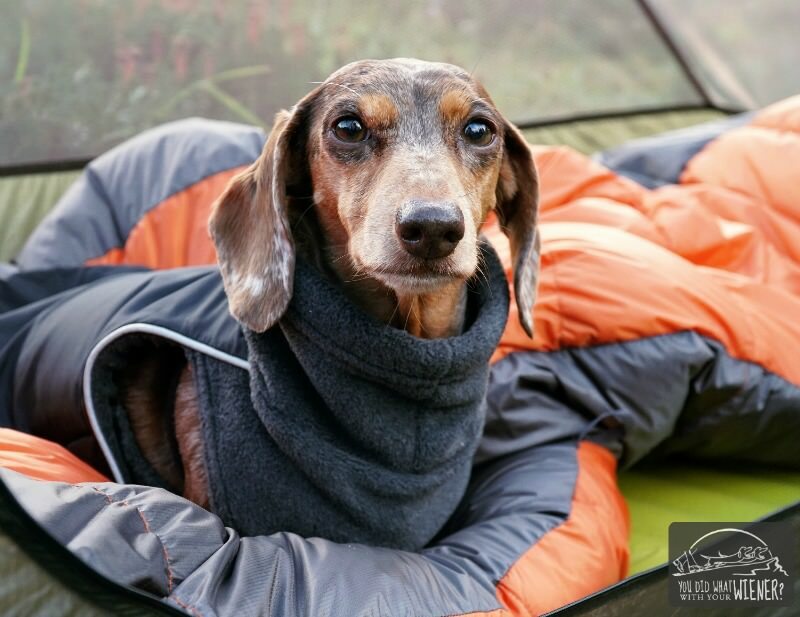 They make a fleece jacket specifically for Dachshunds called the Tummy Warmer (which doesn’t actually cover the tummy but does cover the area under their chest) and a waterproof Winter Coat with an attached turtleneck/hood and a rain coat. 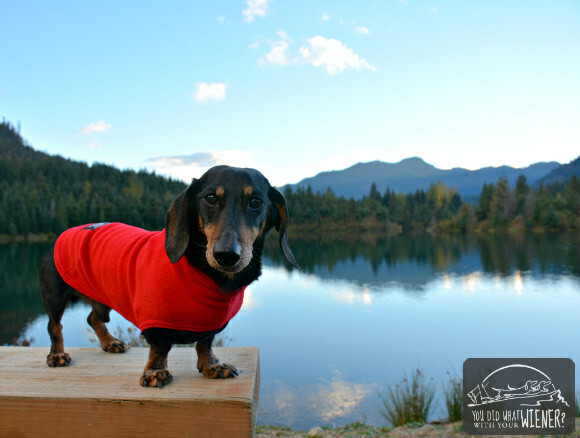 They offer custom made jackets according to your Doxie’s specific measurements and seem pretty affordable. A hole for your harness D ring can be added for an extra fee. Have you bought or used any of these for your Dachshund? What did you think? Do you have any other favorites? We’ve shopped at Dachshund Delights many times. It’s so hard to get a good fit for us WEENIE DOGS, you have to shop at a specialty store (or make it yourself). Love the coat! You know we LOVE Noodle and Friends! Eleanor has to be stylish. I think Chilly Dogs are made in our little capital city! I’ve never tried them but I see them for sale in our local shop. We also got a Cozy Hound one on your suggestion- love it, but we only use it in fall/spring when it’s not so wet and cold. I think it was only $16 and that included shipping to Canada! Chris at Cozy Hound is so great. That’s an amazing deal on shipping to Canada. Thanks for letting me know. They look so cute in their fleece jackets. I need a jacket for Torrey, I will check out some of the companies you mentioned. 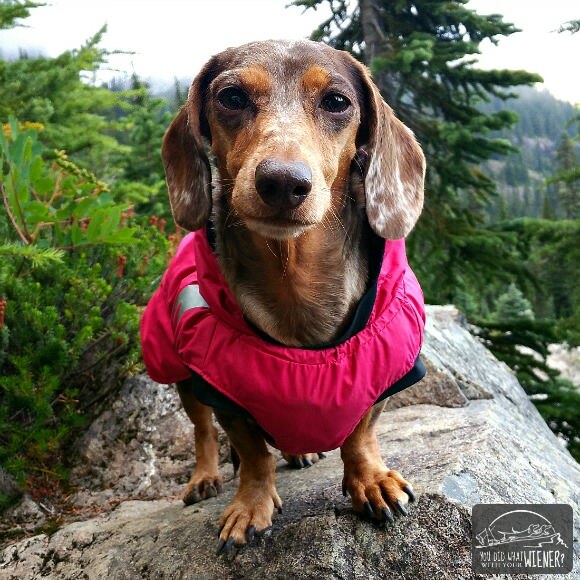 My jacket and harness is from Dachshund Delights. I love them! Harness never chafes me and I can wear it for a twelve-mile hike. The Dachshund Delights coat is fabulous. I have a WeatherBeeta for my doxie. It’s really nice for the short haired guys because it’s both waterproof and insulated and fits well even though it’s not specifically designed for a wiener. I have not heard of that brand but I will check them out. Thanks for sharing! Oh we you have a lovely selection. We seldom wear one but we have lots of furs and we run alot. Stay warm and cosy. Have a fabulous Friday. I drool over the Noodle and Friends jackets, but for the short amount of time Nola would need one here it’s just not practical price-wise. I actually found a sweater (all we really need her except for early Dec-early Jan) at WalMart for $5 last year that fits her surprisingly well! I just throw it in the washer (not the dryer) and it’s good as new. I’ll probably wind up getting a Cozy Hound this year; Nola’s lost fat and gained muscle and gets colder so much easier. Plus her fur is super thin and she’s bald from neck to belly. I didn’t realize Nola was bald on her belly? So is Penny! She has actually lost hair underneath over a period of time – I am wondering if this is normal? Chester has a bald spot on the lowest part of his chest – about palm-of-hand size. I always thought it was because of sleeping and that part rubbing on the blankets most but Gretel doesn’t have it. I know Eleanor from the Spoiled Doxie is bald almost all over. More recently I have heard that the baldness condition is common among Dachshunds. I never knew that. Ammo has a bald belly – it’s definitely a common thing with the doxies (dachshund pattern baldness). He started loosing hair around his neck and it continued down to his belly at the age of 1. Now I actually have to put sunscreen on it in the summer because he goes “tanning” in the backyard and gets a sunburn! Penny had the Casey Jacket from Noodle and friends and I will say that it is super cute and well made. I do not use the D ring that comes attached as Penny is a puller, so we just use her harness underneath the jacket. I do also appreciate that the jacket covers her belly as it does get dirty/wet being so low to the ground. As you know, we also have a fleece jacket from The Cozy Hound. I also love this jacket for the price, quality, and fit. Oh those fleece jackets are so cute! I don’t know why but I seem to keep losing your blog on my reader! grrr!!! Thanks for sharing a link to Ammo’s winter coat! We’ve tried lots of them over the years, including the noodle and friends. So far the Voyagers k9 has lasted the longest (the noodle and friends coats lasted one season) as Ammo is pretty rough on his coats at the farm. Before I found Voyagers he used to have to wear a sweater, his noodle jacket, and another horse-blanket style one ontop to keep warm on the farm. It was becoming too bulky so we decided to try out the Voyagers ones. Now he just wears a voyagers tummy warmer & the voyagers winter jacket with neck warmer (which is soooo great at keeping his ears warm). Keeps him toasty, and he can move so easily. I’m thinking about getting another one so when one is inevitably in the wash he has another to wear. (and I do stick these in the washer but use dish soap so they don’t loose their waterproof-ness, and line dry them). P.S. 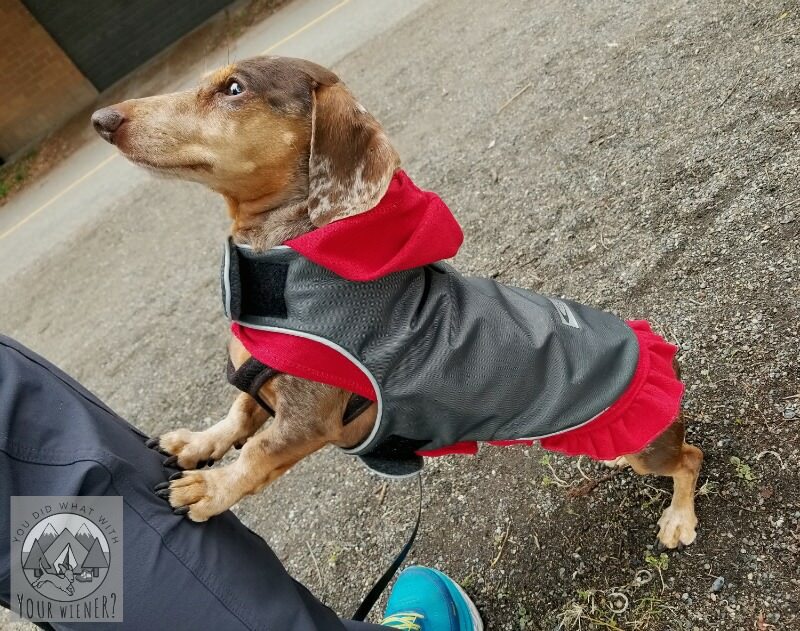 we donate our unwanted doxie coats to the dachshund rescues….so anyone that has outgrown/unworn coats – this is a great way to help other dogs that need to stay warm too! Thank you so much for these recommendations! Taylor is part Dachshund, so this post will come in handy! What a godsend this post is! My 6 dachshunds don’t want to go out in the winter because it’s so cold! I’ve been looking for GOOD sweaters and coats for them and you have given some great links! Thanks! This is just a suggestion for an everyday thing to wear, its not fancy at all but its warm enough. If you have an old sweatshirt (or a new one you don’t wear) remove the sleeves. The wrist will become the neck of this shirt, HOld it up to the dog and figure out where the holes need to be cut for the front legs, and how the curve should be cut for the tummy and the back. No sewing needs to be done, and you might have an old sweater that you can use to judge where it needs to be cut. If you have a super tiny doxy try a womans small shirt, a bigger dog could use a man’s medium. You can find used shirts at Goodwill to practice on until you can get the right fit. These can go in the washer and dryer and will keep your puppy warm inside and out if its not too cold. I’m glad you found a great place to get coats that fit your little bodies! We ended up making our own dachshund coats. We found it difficult to find a store that carries sweaters for doxies and there are some options offline, but they are expensive. I would like to have the ability to see if the coat fit before making that kind of commitment. We got a chilly dog winter coat for franky. It’s great! The design is perfect for the odd dachshund body, especially their barrel chests. PetMyWiener.com also offers custom made Dachshund coats and harnesses that are made to fit each Doxie. Over 23,000 facebook Dachshund fans can’t be wrong 😉 Keep us in mind for the next review. I love the trench coat! Too cute. http://www.weinerwraps.com best place for Doxies to get a coat that covers a lot of the dog, and the fit is awesome! I completed agree about Cozy Hound. It is my go to for my dachshund/corgi mix. She even customized the fleece to a monster print, it makes me smile whenever I put it on him which is often this time of year. Chris at Cozy Hound is wonderful! I got my girls harnesses from Dachshund Delights . I had their jackets made at a local owned doggie store when I lived back east. I would love one that fits like a sweater that zips up their back, not underneath. Very hard to find the right fit. It was very hard finding the right size and style for their life jackets. I will have to look into some of the options others have suggested. We have harnesses from Dachshund Delights too. We have SO MANY harnesses in general 🙂 We have life jackets from Henry & Clemmies bu they appear to have gone out of business. The next best I have found so far are from Outward Hound. Hi! I just wanted to add the LL Bean “Field coat for dogs” with primaloft material is amazing and affordable ($32).The medium size fits my 18 lb standard-ish very well, covering his back all the way to his tail (give-or-take an inch). It’s machine washable, and very durable. We’re in our third winter with it, and it looks as as new with every-day use. You even have the option to get it embroidered for $8 (free if you’re a LL bean card holder). It has enough give to put an additional sweater on underneath for extra warmth/extra chest and belly protection. Our little guy is picky when it comes to clothes, so this was a major lifesaver living in CT. Hope this is useful! I have a standard and a mini doxie! And Equafleece UK (made in Britain… the British site is much much cheaper than the US site and shipping is super inexpensive!!) makes GREAT products! I’ve ordered 6 different things for my doxies and they have been perfect and exactly what I was looking for!! Great great company!!! We don’t have a problem with the cold but our mini is so low to the ground and her fur is so soft and wooley that she picks up everything from the ground on walks. So walks turn into a walk and a combing. Do you have suggestions for t-shirt weight shirts? It is mostly her chest and front legs that need covering. Pup R Wear is agree at site for Doxies, all dogs actually…….but they have a section “for extra long dogs”! Of course a Doxie is on this page. They have coats, sweaters, boots, tanks, polos.. Things for all year round. The tanks or polos would be good for Cyndi’s mini’s belly! Rain coats and winter coats that are waterproof! I’m surprised no one has mentioned Houndz In The ‘Hood yet. They make breed specific clothing for harder to fit breeds, including a dachshund line. They have bodysuits in several weights, plus T-shirts and sweatshirts. Not cheap, but great for keeping my longhaired dachshund’s belly dry and for keeping him warm. Great for snow! I recently bought a jacket made bt Professional Choice from Chicks Saddlery. Same material as Professional Choice uses for humans, waterproof and fleece lined. Made similar to noodles, fits around the neck with a flap that goes between the front legs with a belly band that velcros. On sale for half price do it cost 14.99..
Hi Mary. Thanks for giving this pup a good home. I do not recommend a dog eat “table scraps”. Meaning they should not eat food you hand them off your plate. Often times, these are foods that are not healthy for a dog because they contain spices, are flavored with ingredients poisonous to a dog (onions, etc), or are really high in calories which can make then fat and negatively affect their health. Can a dog eat “human food”? The answer to that can be yes. For example, raw eggs (shell and all), raw meat with no seasonings, plain, unsweetened yogurt, and cooked veggies with no butter or seasonings can be healthy for a dog. Just be sure to check the ingredients carefully and watch the portion sizes. It’s very easy to give your pup “a little bit here and there” and end up with a dog that is overweight. I suggest only giving those kinds of foods in addition to their regular meal at those times and giving a little less of the dog food if you add other things to it.